Copyright © 2019 by Dennis F. Paulaha. All rights reserved. In accordance with the U.S. Copyright Act of 1976, no portion of this book may be uploaded, reproduced, or transmitted in any form whatsoever, or by any means, electronic or mechanical, including printing or photocopy, without permission in writing from the publisher, except for short quotes in critical articles or reviews: patronbooks@sbcglobal.net. First published 2019 by Dennis F. Paulaha. — Leo Tolstoy, What Then Must We Do? The truth at the core of the Minneapolis 2040 Plan is that it is part of a nationwide scheme intended to maintain the status quo of racial disparity, environmental damage, and the massive inequality of incomes and wealth by claiming private individuals, businesses, and so-called markets can fix problems that can be fixed only by having government do what only government can do. Minneapolis Mayor Jacob Frey, City Council President Lisa Bender, and City Planners David Frank and Heather Worthington have declared themselves liberal heroes—champions in the fight against racism, global warming, and the lack of affordable housing in Minneapolis. To help spread the word, a Public Relations firm was hired to carry the news of their great victory to liberal media people throughout the land. And the liberal media people, apparently without the time or interest to read past the PR promises, have not only been heaping praise on the Minneapolis heroes, but encouraging liberals in other cities to follow their lead. The Minneapolis 2040 Plan is not a victory for liberals. The 2040 Plan has nothing to do with liberal or progressive ideas or goals. It is a far right dream; a pure anti-government, anti-regulation, right wing attack on the people, families, natural environment, and wealth of the city of Minneapolis. It is a Plan based on the long-standing far-right idea of shrinking government by eliminating laws, regulations, and policies that protect families, neighborhoods, property values, wealth, business, the natural environment, and the economy of the city, region, and state, in order to turn the city over to private developers and private investors. It is a Plan that will hurt everyone it claims it will help, other than developers and investors. It is a Plan that will weaken both the city of Minneapolis and the state of Minnesota. And if the liberal media outlets that have been conned into praising and promoting the plan are successful in getting other cities in the country to follow Minneapolis, the anti-government, anti- regulation plan will, without question, diminish not only the city of Minneapolis, but weaken the entire country. The Minneapolis 2040 Plan is an attack on property rights and home ownership, which means it is an attack on the most important financial asset most families have—the equity in their homes— which means it will, without question, increase income and wealth inequality between the very rich and everyone below. The Minneapolis 2040 Plan is a plan to force an entire city (other than the very wealthy) into being renters for life, with no regard for the retirement needs of residents, or for the financial benefits home equity gives a homeowner and a homeowner’s children and grandchildren, or for the young renters who may, sometime soon, want to have families and live in homes with grass and trees and off-street parking. 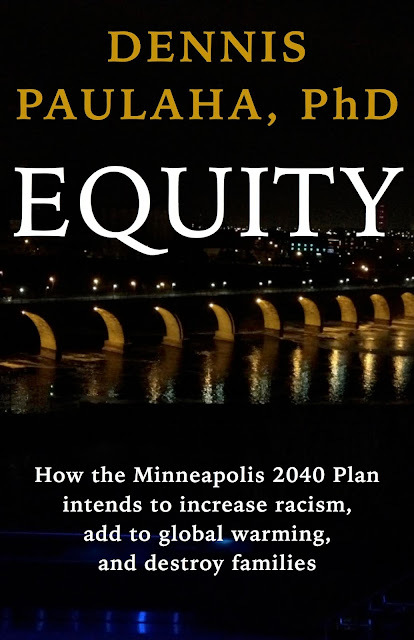 The Minneapolis 2040 Plan is based on the lie that single-family zoning was, and is, the policy that prevented, and prevents, blacks from buying homes, and that by eliminating single-family zoning, the City of Minneapolis will be attacking racism in housing. The truth is, it was “redlining,” not single- family zoning, the FHA and banks used to make it difficult or impossible for minorities to obtain mortgages on homes in minority neighborhoods that were outlined with red lines on maps. And eliminating something that did not cause the problem cannot solve the problem. It will make the problem worse, because the real cause is being ignored. for all but the very wealthy, it will make home ownership and wealth creation virtually impossible for blacks and other minorities. The Minneapolis 2040 Plan was also sold on the idea that a higher population density leads to a smaller carbon footprint, which, of course, is not true. That false claim comes from comparing a high density city to a spread out suburb, where people often have to drive further to get where they are going. But every legitimate study includes the same WARNING, which is to not confuse the city versus suburb idea with increasing the population of either a city or a suburb. The warning is nothing more than common sense, given that it is impossible to increase the population of any area and not have more carbon dioxide emissions. Claiming that will not happen is a lie that will cause the city of Minneapolis to become an even greater contributor to global warming. eliminating single-family zoning throughout the entire city, because there is no need to accommodate people who will not be in the city if single family homes are not replaced with multi- unit rental buildings. That lie, by itself, should have been enough to demand the entire plan be scrapped so that a plan based on honesty and facts, and with regard for all people, not just developers and investors, could be created (which is what happened in Austin Texas when people found out the population forecast in a similar plan to eliminate single-family zoning was a lie). But what Frey and Bender and City Council Members knew, and know, is that by the time the lies are exposed, the city of Minneapolis will be changed forever. Once single-family homes are torn down and replaced with multi-unit rental buildings with no off-street parking, neighborhoods will be destroyed, the possibility of home ownership for all but the very wealthy will be gone, and it will be impossible to replace what was lost. Years ago, someone came up with the idea of calling Minneapolis the Minneapple. It was a tongue-in-cheek advertising promotion based on the idea that, because of its economy, educated population, arts, culture, restaurants, and sports, Minneapolis could be thought of as sort of a small New York City sitting in the Midwest. Others, for the same reasons, called Minneapolis the Paris of the Midwest. Whether or not either of those labels was justified, most people who live in or visit Minneapolis see it as a great city. It has one of the best park systems in the country, a number of boating and fishing lakes within the city limits, wonderful arts and music communities (Walker Art Center is one of the most important modern art museums in the world, the Guthrie Theater is one of the top regional theaters in the country), and much more, including restaurants with James Beard award-winning chefs and bakers. restaurants, bars, and retail shops offers an exciting urban environment to owners and renters of all ages. It also has vibrant neighborhoods with few, if any, single-family homes; neighborhoods dominated by condominiums and apartments combined with restaurants, bars, and retail shops that offer a somewhat different urban mix to people of all ages. The North Loop, or Warehouse District, is considered one of the top “hipster” neighborhoods in the country. Uptown feels more like Barcelona or Paris (sort of) every day (including some of the same parking problems). And as condominium buildings spread from the city center along the Mississippi River, with the Guthrie Theater as a centerpiece, and begin to surround the new Vikings’ stadium, the choices and opportunities continue to grow. However, no city is an island. Without seeing a sign, it is difficult to know when you cross the Minneapolis-St. Paul line during the ten to fifteen minute drive from one downtown to the other. And with St. Paul to the east, there are great suburbs and small towns north, south, and west of Minneapolis. All of which means a Plan that assumes Minneapolis is an autonomous geographical entity is doomed to fail. People who live in condos and apartments in downtown Minneapolis or in single-family homes, duplexes, apartments, and condos in single-family zoned neighborhoods throughout the city work in many different parts of Minneapolis, in St. Paul, in Minneapolis suburbs, in St. Paul suburbs, in small towns outside the suburbs, and in Wisconsin. People who work in Minneapolis live in Minneapolis, St. Paul, Minneapolis suburbs, St. Paul suburbs, small towns, and Wisconsin. People who live in condos and apartments in downtown Minneapolis, or in single-family homes, duplexes, apartments, and condos in single-family zoned neighborhoods throughout the city and suburbs, take advantage of entertainment, restaurants, and bars throughout the the City of Minneapolis, including many located in suburbs and neighborhoods with single-family zoning. The large department stores that, in the past, were the center of activity in downtown Minneapolis are gone, replaced by restaurants, bars, smaller retail, and entertainment. Disneyworld combined, is in Bloomington, a suburb just minutes away by freeway from virtually anywhere in Minneapolis and most Minneapolis and St. Paul suburbs. Office buildings that at one time would have been once clustered together in downtown Minneapolis are spreading into the suburbs. And all that is good for people who value a high quality of life. It is also good for business, because the quality of life in Minneapolis makes it easier for businesses to attract the best employees, whether they choose to live in condos or apartments in downtown Minneapolis or in single-family homes, duplexes, apartments, and condos in single-family zoned neighborhoods throughout the city and suburbs. And it all exists today because of the protection afforded in the past by zoning laws and regulations. Of course, like most cities in the world, Minneapolis has neighborhoods that have been in residential and commercial decline for years, a shortage of affordable housing, and a recognition that it is necessary to do something about global warming. It has also been singled out as having one of the worst records of racial disparity in the nation. And it is within that reality, where much of the city’s economic success can be credited to smart (meaning flexible) zoning laws and regulations that limited, but did not shut out, the ability of developers to buy and tear down single family homes and replace them with much more expensive single-family homes, multi-family condos and apartment buildings, even commercial buildings, that the Minneapolis 2040 Plan was created, a Plan with a promise to solve real problems and make what is good about Minneapolis even better. Unfortunately, the claim by Mayor Jacob Frey, City Council President Lisa Bender, and City Planners David Frank and Heather Worthington that eliminating single-family zoning is the magical privatization mixture in the bottle that will reduce the city’s carbon footprint, help solve the affordable housing problem, and help those who were left behind in the past (either because of direct discrimination or by what the Minneapolis 2040 Plan calls racist zoning laws), is a lie. It is a lie, because there is no question that privatizing the city by eliminating single-family zoning will keep people of color in a rent-for-life cycle of poverty, increase the city’s impact on global warming, destroy affordable housing, and increase income and wealth inequality. Only a far-right extremest would think an acceptable “solution” to the affordable housing problem in any city is to let private developers tear down single-family homes and replace them with apartment buildings with no grass and no off-street parking. Or support a “solution” that forces the most vulnerable individuals and families out of the city or into homelessness. Or believe an acceptable “solution” is one that decreases the opportunities for all but the very rich to purchase homes and build wealth. Or promote a plan to knowingly increase income and wealth inequality. And by not only allowing, but encouraging, developers to destroy massive quantities of single- family homes, that is exactly what the 2040 Plan will do. It will reduce the quantity of single family homes and sentence a large percentage of the city’s population to a life of renting with little or no possibility of ever purchasing their own homes. It will cause the irreversible destruction of healthy neighborhoods. It will, without question, usher in one of the largest privatization schemes ever put into a city plan. Unfortunately, Mayor Frey and City Council President Bender have made it absolutely clear they are more interested in adding to the profits of developers and landlords than in supporting, protecting, and improving the incomes, wealth, and quality of life of residents, as well as the businesses, economy, and natural environment of the city. The question is: When the next elections take place, will voters remember the role Mayor Frey and Council President Bender played in the decision to let developers gut the city of Minneapolis, increase the affordable housing problem, increase the costs of running the city, increase taxes, do greater harm to the natural environment, destroy home equity for all but the wealthiest families, force low income people and families (especially minorities) out of the city or into homelessness, and increase income and wealth inequality? Is it possible for Mayor Frey, City Council President Bender, and City Planners David Frank and Heather Worthington to explain how letting developers tear down the most affordable single- family homes in North Minneapolis and replace them with apartment buildings, while, at the same time, taking away subsidies for the poorest families, is going to help anyone in North Minneapolis? Is it possible for Frey and Bender to explain to the people of North Minneapolis how taking away the houses they are living in and replacing then with apartments with rents they cannot afford is good for them? Frey and Bender can make all the promises and claims they want about their staunch liberal plan to fight racism, but the truth is, the Minneapolis 2040 Plan is nothing but sickening old-time racism whose obvious intention is to force minorities out of the city or onto the streets. It is gentrification on steroids. Does that sound extreme? It’s not. housing and eliminate the financial help that gives the poorest people and the neediest families a place to live. So if Frey and Bender and other City Council Members want to be honest, they should be pushing shopping carts around during their next campaigns, to make it clear to the people they are claiming to help where they really want them to end up, which is on the streets. A similar “un-zoning” plan was thrown out in Austin, Texas before the City Council could even vote on it when it was pointed out that there was nothing in the plan to deal with the increase in homelessness that would be caused by eliminating single-family zoning. If you want to help people who need help, help them. Don’t help developers and investors and use people who have been discriminated against in the past as an excuse to implement a plan that will harm them even more. It is worse than trickle-down economics. It is northern racism: If you claim you are helping minorities, then you can do as much damage to them as you want. celebrating a great liberal victory look either stupid or corrupt for using the legislative process to stick more knives in the backs of black families. How far will it go? Where will it end? No one knows. But if you look at the facts, instead of the false promises, it seems Minneapolis is being run by a bunch of Democrats wearing MAGA caps. Frey and Bender played a clever publicity game to get the few public meetings and discussions they held focused on Southwest Minneapolis, which is, on paper, a single-family neighborhood, but which, in reality, is a successful mix of single family homes, duplexes, apartment buildings, condos, retail spaces, restaurants, bars, coffee shops, and parks. They did it to focus the discussions on what they imply are the wealthy, white, racist homeowners in Southwest Minneapolis so no one would look at what is going to happen to North Minneapolis. Which is easy to predict. Developers will come in and rip out one single family home after another, replacing each one with an apartment building. say in whether or not the house they are living in will be sold to a developer. When the house is sold, the renters will have to move, whether or not it adversely affects their jobs or families. Those who are currently having difficulty paying rent will have virtually no chance of paying the higher rents in the new buildings. Some will be forced to leave the city. of color to ever buy their own homes as their incomes increase will be taken away forever, because the homes will no longer exist. The fake promise from Frey and Bender is that by tearing down single-family homes in more expensive neighborhoods and replacing them with apartment buildings, people of color will have an opportunity to move into those neighborhoods—as renters, not home owners. Mayor Frey likes to characterize Southwest Minneapolis neighborhoods as neighborhoods with large, expensive, single-family homes on large, expensive lots. Which means Mayor Frey has never been in Southwest Minneapolis or he is lying. There are some large single-family homes on large lots in Southwest neighborhoods, some worth millions of dollars. There are also medium size houses on medium size lots and very, very small houses on very small lots. There are restaurants, retail stores, coffee shops, bakeries, parks, and more. There are duplexes, apartments, and condos. There is easy access to jobs, eating, drinking, and shopping in Edina, St. Louis Park, and the Mall of America, even to gourmet restaurants in Robbinsdale. The problem is, home prices and rents in Southwest Minneapolis are not affordable for everyone (which is true, of course, for every house in the city, because there are people and families that cannot afford, without government help, even the least expensive rents in any neighborhood). And the new 2040 rental units will be even more expensive, because developers will have to first purchase single-family homes for $400,000 to $700,000 and tear them down before building three- or four-unit apartment buildings. When Frey and Bender were forced to accept the fact that their privatization scheme will cause rents to increase, not decrease, an amendment was added to the 2040 Plan that requires new apartment buildings to have ten percent of their units priced below market-rate rents. Does that mean low-income people will be able to rent those units? No. First, it will only matter for buildings with ten or more units. Second, even at below market-rate rents, rents in the technically illegal “rent-controlled” units in higher-income neighborhoods will be higher than current “unaffordable” rents in low income neighborhoods. Third, a standard question on economics tests is: Will rent control keep rents at the rent controlled level? The textbook answer is, no, because people who are willing and able to pay more, will pay more, by making under the table payments to landlords or managers to be the “chosen” renter. Fourth, the few people of color who might be able to move into the few rent-controlled units will be, as they say, “tokens,” not a real solution to a real problem. Will eliminating single-family zoning solve the problem of black ownership? No. It will make it worse, because it will do even more to take away the opportunity to own a home. Will it provide new rental units at lower prices? No. Rents will increase as young singles and couples move into the new units in North Minneapolis. Is there anything good that removing single- family zoning will do to help people of color and indigenous neighborhoods, or solve the affordable housing problem? No. Because, regardless of what the Plan’s supporters claim, none of the problems are simple supply and demand problems. The truth is, removing single-family zoning in the two-thirds of the city still zoned for single- family homes, which the Plan calls up-zoning, is a new version of the racist redlining policy the FHA and banks used in the past to deny mortgages on houses in areas inside red lines drawn on a map, which prevented minorities from buying houses. (It was redlining, not zoning, that the FHA and banks used to prevent blacks from obtaining mortgages in “high risk” minority neighborhoods, not in other neighborhoods). them with apartments that will not be affordable to the people the Plan promises to help. In more expensive neighborhoods, where the most affordable single family homes are now being replaced with million dollar single-family homes, when single-family zoning is eliminated, the most affordable single family homes will be replaced with high-rent apartments. Those who cannot afford to pay rent now will find rents even less affordable. Where will they go? The 2040 Plan does not address that issue. Most important, instead of helping people buy homes and build wealth, the Minneapolis 2040 Plan will destroy the houses they might someday be able to afford. And as more and more single family houses are bulldozed and replaced with apartment buildings without off-street parking, the possibility of home ownership disappears, along with some of the greatest and healthiest single- family neighborhoods in the world. Very simply, it has been shown that the single most important factor keeping black families in a cycle of poverty is not education disparities or discrimination in the workplace, but policies that prevent blacks from building home equity. minority neighborhoods. More recently, as a Brookings Institution research paper concluded, it is discrimination that affects home prices in minority neighborhoods that limits the growth of equity. Which means the Minneapolis 2040 Plan, by focusing on the false issue of single-family zoning while ignoring the real problem, which is home ownership and the intergenerational benefits of home equity, does not really care about its list of great goals. MINNEAPOLIS CITY COUNCIL VOTES TO INCREASE CARBON-DIOXIDE EMISSIONS On Friday December 7, 2018, the Minneapolis City Council passed a 2040 Plan gutting zoning laws that control population growth and limit carbon dioxide emissions, defying international negotiations to scale back planet-warming gases. Is it irony or collusion that the Minneapolis City Council vote in favor of the 2040 Plan took place on the same day President Trump’s Environmental Protection Agency proposed gutting an Obama-era rule requiring coal-fired power plants to reduce carbon dioxide emissions? Or that it happened on December 7th, the month and day President Franklin D. Roosevelt said would live in infamy? Too restrictive to whom? Developers. One of the false claims in the 2040 plan is that all the studies and all the research say a higher population density leads to a lower carbon footprint. What the studies actually say is, increasing population density will increase, not decrease, a city’s carbon footprint. Even highly educated people have been conned into believing the density lie, because when someone in authority who calls himself or herself a “liberal” refers to studies, research, and data, many educated people tend to believe them. blatantly lie to the public about something as important as global warming. But what all legitimate studies actually conclude about the relationship between population density and carbon footprint is not what the Planning Department, Mayor Frey, and City Council President Bender claim they say. Comparing the carbon footprint of half a million people living in a city to half a million people living in a sprawling suburb seems simple. The carbon footprint of the city should be smaller, because there are more public transit opportunities, and because things are closer together, which can mean shorter trips (measured in miles) in cars. Ignoring all the holes in that argument, such as knowing it is not only cars that cause environmental damage, or that sitting in stop-and- go traffic jams for maybe an hour to make a five mile drive to and from work may emit more greenhouse gasses than driving twenty miles back and forth in a suburb, what matters is not just the miles driven, but the time the engine is running. The truth is, every legitimate study tells the reader the city-suburb example cannot be used to claim forcing a higher population density into a given geographic area will create a smaller carbon footprint. Why? Because comparing a city to a suburb is not the same as what happens when the population of a city or suburb increases. Which is what the goal of eliminating single- family zoning (called up-zoning policy in the 2040 Plan) does. It increases population density by increasing population. Even if up-zoning leads a few more people (because there will be more people) to walk or ride bikes to and from work, there will still be more people driving cars, which means a larger carbon footprint, because every single-family house replaced with a three- or four- or ten-unit apartment building means three or four or ten or more cars instead of one or two, furnaces heating a larger total space, more traffic which means more people spending more time idling in traffic jams, less grass, fewer trees to soak up greenhouse gasses, more water run off, and more. Most elementary school students can understand why eliminating single-family zoning to intentionally increase population density will increase, not decrease, a city’s carbon footprint. And why eliminating single-family zoning is bad for the natural environment and will make the global warming problem worse. The following Opinion piece was published in the Minneapolis Star-Tribune on July 23, 2018. I wrote it assuming the mayor, city planners, and city council members were actually looking for a solution to the affordable housing problem. It was a bad assumption. The truth is, the new Minneapolis “liberals” seem to be part of a nationwide effort to eliminate zoning laws that restrict developers and investors from gutting cities for profit, while increasing wealth inequality, racial disparities, and global warming. The argument behind up-zoning in the Minneapolis 2040 Plan is that if the quantity of housing units is increased by removing or relaxing building standards and allowing single-family tear- downs to be replaced with duplexes, fourplexes, and commercial buildings in neighborhoods currently zoned for single-family homes, the increase in supply will stabilize or reduce prices. The problem is, quantity is not the same as supply. And we can be in the supply and demand business only if all housing units are identical, buyers do not care which house they buy, and all houses sell for the exact same equilibrium market price. And because none of that is true, we are not in the supply and demand business. We are in the quantity business. And one of the best examples of increasing the quantity of housing units and the population density in a city is the massive condominium complex recently completed in Wayzata. Did low- income and middle-income people rush to buy the new units, given that, without traffic, they are only 10 or 15 minutes from downtown? No. Because units start at $1 million each. In the real world, developers build houses and condos they think will give them the greatest profits, which does not mean, the more they build, the lower the price. profits while making the neighborhood even less affordable. In other words, if someone wants to claim increasing the quantity of housing units in a neighborhood or city lowers prices, they can look at Wayzata, Uptown, downtown, Edina, the north loop, or anywhere else large condo developments are taking place. They can also look at new houses being built in the suburbs. Does building new houses in Edina or Minnetonka mean prices go down? No. Prices are up to the builder, and may be affected by some negotiating with the buyer. But no builder is going to think that because the house he just completed adds to the quantity of houses in the neighborhood, or the city, he will have to sell it for a lower price. That’s absurd. Am I saying house prices are not affected by the number available for sale and the number of buyers at any point in time? No. I am saying the price of any house is not the result of supply and demand determining an equilibrium market price. It’s one house or housing unit at a time, sold by a builder or an owner, and the more buyers there are, and the more money buyers have, and the fewer houses there are for sale, and the lower mortgage rates are, the higher the negotiated price is likely to be. But that is not the same as the textbook idea of supply and demand, where all units are identical. Finally, if a three bedroom, two bath single family house is torn down and replaced by a building with four apartments or condos, and the price of each condo unit is less than the now destroyed single-family home, can we say prices have fallen? Not if we want to be truthful, because we are talking about apples and oranges. The price of a condo unit that is smaller than the single- family house that was torn down and which, according to the 2040 Plan, will have a smaller (and shared) yard and will not have off street parking, cannot be compared to the price of the now-gone single-family house. You are not getting the same thing for less money. You are getting something different for less money. And you can’t use those numbers to say prices went down. We should also not fool ourselves into thinking builders will buy houses for $400,000, tear them down, and build fourplexes with units that sell for less than $200,000 anyway. Even if they could, they wouldn’t want to, because that would mean giving up profits. The most likely outcome of upzoning is that single-family houses will be replaced with condo units that sell for more than the single- family houses that were torn down to build them. will not increase either affordable housing or diversity in upscale neighborhoods. Three months after the above article was published, the Star-Tribune published a letter from two guys at the Minneapolis Federal Reserve Bank who thought they could write a rebuttal to the economic facts in my article. One has a Ph.D. from Chicago, which tends to turn out free-market “economic thinkers” who dislike government and government regulations. The other has Bachelor’s degree and a Master’s degrees, neither of which is in economics. people write a letter to the Star Tribune in support of eliminating zoning regulations designed to protect property values, wealth, and the Minneapolis economy just so developers will have the right to gut-for-profit every healthy neighborhood in Minneapolis? Or why a couple Fed guys would be allowed to write a letter that misstates, misuses, and lies about the simplest of all economic principles, misstates and lies about facts, and misstates and lies about what others have written in order to make an argument that, if presented in any economics class in the world, should receive a failing grade? More than that, the only thing the letter by Feldman and Wright proves, even to those who have never taken an economics class, is that the Federal Reserve is either in bed with developers or is no longer hiring real economists. House values decline with age? Zoning laws and building codes increase housing costs and provide no benefits? Building very expensive houses will cause a trickle up move that will increase the “supply” of low cost houses at the bottom? Versions of the Minneapolis 2040 Plan were successful in Portland and Seattle, even though the spokespeople for the 2040 Plan (as part of their sales pitch) say such plans in Seattle, Portland, and San Francisco were total failures? can help low income people buy houses, even if it is at higher prices? The simple purpose of my article was to explain why the creators and promoters of the 2040 Plan should not expect policies based on a misuse of economics to help reach the Plan’s stated goals or expected results, which include helping solve the affordable housing problem. The simple purpose of the Feldman and Wright letter is to help developers destroy some of he greatest single-family home neighborhoods in the world. For your information, I am enclosing the Opinion piece I wrote to the Star Tribune and a paragraph-by-paragraph response to the Feldman and Wright letter. My reason for writing you is to hope that if you look honestly at the irreversible damage the Minneapolis 2040 Plan (especially the up-zoning) will do to the residents and the economy of the city and region, while doing even more damage to the people it claims it will help (people of color and those in indigenous neighborhoods who were left behind by previous plans), you might use the Fed’s influence to help protect the residents and the city’s economy from developers who, without being constrained by zoning laws and building codes, will do what is most profitable for them, regardless of the harm it does to others. Of course, doing so will require you to dismiss the economic fallacies and lies in the Feldman and Wright letter, many of which come directly from Austrian economists who have always argued that anything government does destroys wealth and hurts the economy and anything private individuals and businesses do, especially if it is unregulated, is as good as it gets. P.S. I would love to be in a room where Feldman and Wright are up at a blackboard trying to make their “argument” to real economists. My response to the October 17, 2018 letter by Ron Feldman and Mark Wright from the Minneapolis Federal Reserve Bank regarding my July 23, 2018 Opinion piece on the Minneapolis 2040 Plan. Interesting response from the Federal Reserve. I would suggest Ron Feldman and Mark Wright reread my July 23, 2018 article in the Minneapolis Star Tribune. Then I would suggest they reread every economics textbook they might have. I would like to assume, because Ron Feldman and Mark Wright work at the Minneapolis Federal Reserve Bank, they would put the residents and the economic health of the city and region ahead of special business interests, an assumption that is dismissed by their blatant misuse of economics in order to put developers and commercial interests ahead of the residents, the city, and the regional economy. One of the most important things I learned from Milton Friedman, one of the world’s most famous economists, is that if you can get someone to accept or skip over an initial premise or statement, even if it is false, you have a good chance of winning an argument, which is why first paragraphs or opening statements are always the key to the honesty and validity of any argument. In their first paragraph, Feldman and Wright present two statements which, if readers assume are facts rather than opinions, make it easier for them to sell an economic idea that cannot be supported with textbook economics. The first is that Minnesota is experiencing an affordable housing crisis, not a problem. The second is that because there is “no consensus about how to fix this problem” the reader should accept whatever solution Feldman and Wright offer. Combined, the two false premises are intended to lead the reader to accept the claim that up-zoning the city of Minneapolis, which means giving developers the right to bulldoze healthy city neighborhoods for profit, is not only a solution, but the only solution, and because there is a crisis, it must be enacted as quickly as possible. The truth, following textbook economics, is that up-zoning is a “solution” that will make the problem worse, not better, by putting money in the pockets of developers and the banks they work with while ignoring the very high economic and environmental costs of the one-and-only solution that will be borne solely by the residents and the economy of Minneapolis. Paragraph two: Surprisingly, some “experts” refuse to see private market production of housing as a central solution to the affordability problem. They argue that relying on the market to increase supply will not lower prices (“Minneapolis 2040 Plan: An economic principle is being misused,” July 23). More government subsidies for housing are the only path to affordability, in their view. Assuming their quotes around “expert” are intended to imply I am not an expert, but they are, it is a far-fetched implication, given what they wrote. Any real economist knows so-called “private markets” cannot solve all problems, such as providing a sufficient national defense, protecting property rights, building roads, providing education, and, in this case, providing a solution to the affordable housing problem. Private individuals and groups can provide a national defense, but what my neighbors with guns can do is not enough national defense for me. Just as private developers cannot (or will not), on their own, provide a “sufficient” quantity of affordable housing. Again, if the Fed guys would check out the textbooks I assume at least one of them read, they will see that when I say “we are not in the supply business” unless all units on the quantity axis of the diagrams they draw are identical, I am simply stating what is in any textbook, undergraduate and graduate, and because that is not the case with houses, neither they, nor anyone else can draw a supply curve intended to represent “housing” or “housing units” in Minneapolis, or any other city that does not break the “apples and oranges rules” of economics. I also, as do most people, resent having someone claim I said or wrote something I did not, such as claiming I said: “More government subsidies for housing are the only path to affordability, in their view.” My experience is that when people lie about what an opponent said or wrote, it is because they do not have a logical or fact-based argument of their own. Paragraph three: We will not mince words: These views are dead wrong, and dangerous. Market supply must be a critical part of the solution. And governments must reform policies that drive up housing costs. This is a good one. There is nothing “dead wrong” about pointing out that lying about textbook supply and demand curves should not be expected to yield an acceptable solution to a real problem. Then they write, “And governments must reform policies that drive up housing costs.” So, the question is: Do they or do they not believe government must be part of the solution? “Reforming” zoning by eliminating protections for private property and wealth is not government helping solve a problem; it is government turning the city over to developers at the expense of current and future residents and the city’s economy. Paragraph four: Arithmetic alone shows that increasing private market supply is critical to reducing the cost of housing. I like arithmetic, but their arithmetic does not support their private-market supply statement. Paragraph five: In 2006, the Metropolitan Council estimated that the Twin Cities would need to provide an additional 51,000 homes affordable to low-income households during the 2011-20 period. Government subsidies to builders have yielded only about 7,000 such affordable homes so far during that time frame. Even if governments had subsidized builders at quadruple that rate, we would still be 23,000 units short of what is needed by 2020. I will assume the point of their arithmetic is to show, following Ludwig von Mises, that nothing government does or can do will help solve any problem, and that, therefore, the only “solution” is to give developers the freedom to gut neighborhoods for profit. The part of the arithmetic that Mises, Feldman, and Wright ignore is that no developer will voluntarily buy and tear down a house in an upscale neighborhood and build one that can sell for $200,000 when one that can sell for $1,000,000 or more can be built. It should also be pointed out that the population and population density numbers in the 2040 Plan are not forecasts, they are the Plan’s goals, goals that should be debated, given the increased costs they will impose on the city and the natural environment. Paragraph six: The record over a long period of time suggests that state and city budgets will not fund future building subsidies of a magnitude that would produce the needed units. That statement, true or false, has nothing to do with what I wrote. I did not offer a solution, only a criticism of the Plan’s solution based on a misuse of textbook economics. And as far as I know, no one opposed to the Plan has offered subsidies as a solution. Paragraph seven: What about giving housing subsidies to households instead? Sounds appealing. But housing subsidies increase the demand for housing, so unless total supply also increases, prices will just go up. Current landlords and homeowners will get richer, but low-income families will have even fewer options. I hate straw man arguments. And in this paragraph, the argument is that by dismissing any possible hope for subsidies to reduce housing prices (which has never part of any real economic subsidy argument), it is necessary to make zoning changes that will allow developers to build triplexes and more in neighborhoods currently zoned for (mainly) single-family structures. That is a pretty big jump in logic, one few intelligent people are likely to accept. There is, of course, another problem with this paragraph’s attack on subsidies (a solution I did not raise or discuss). It is: If the purpose of subsidies is to make it possible for people to buy housing, then, according to this paragraph, subsidies can be successful, because they allow people to buy houses, even if it is at higher prices. Paragraph eight: We’re back to the market, then. How does building more market-rate housing increase the supply — and lower the price — of housing affordable to low-income households? Let’s look to other cities for an example. As I explained, we are not in the supply business; we are in the quantity business, and increasing the quantity of housing does not mean prices fall. Again, I gave simple examples in my article. Paragraph nine: In Portland and Seattle, thousands of new market-rate apartments have lowered rents in previously existing properties. If the new market-rate apartments had not been built, new arrivals to these cities would have competed for older and cheaper units. This would have bid up prices, displaced current residents and reduced the supply of affordable homes. It is interesting that Feldman and Wright thought it was a good idea to bring in arithmetic from Portland and Seattle, given that the spokespeople for the 2040 Plan freely admit, as part of their sales pitch, that similar plans in Seattle, Portland, and San Francisco were abject failures. Paragraph ten: Building more housing of any type affects the price of all other types of housing. For every luxury unit filled, a more modest home is left behind for another family to move up into. Build enough luxury homes, and the prices of regular homes fall, too. core of how misusing (or lying) about what economists mean by supply and demand can lead to arguments and policies that support one identifiable group (developers) against an entire city’s population. Paragraph eleven: There also is a longer-term effect. Housing tends to decline in value over time, as it ages and as tastes for housing change. Older housing then becomes more affordable. Indeed, the Met Council found that the greatest source of new affordable housing comes from existing market- rate homes that have become cheaper over time. This takes time, but increasing supply now will prevent a re-emergence of the affordable housing crisis in the future. And research shows that this process occurs much faster than observers think. Are you kidding? “Housing tends to decline in value over time, as it ages and as tastes for housing change.” That won’t fly in a fifth grade class. It does not take an “economist” to look at numbers (arithmetic) and see it is not true. If it is possible to find numbers that show this statement to be true, it is not numbers from Edina, Wayzata, Minnetonka, Southwest Minneapolis, Kenwood, Robbinsdale, or Bloomington. It might be true in city neighborhoods that are in decline because past plans left them behind. Paragraph twelve: But we are not simply relying on markets to work. Our governments have the power to encourage the creation of new, lower- cost, market-rate housing. Governments can start by looking at policies that constrict housing supply by artificially inflating building costs. Whether or not past government policies “artificially” inflated building costs (the false implication being government policies add costs without benefits), gutting healthy neighborhoods will not lower building costs. Paragraph thirteen: Relaxing zoning regulations to allow greater density is one option. Eliminating building code requirements that raise costs without commensurate benefits is another. And there are many more options for policymakers. Unlike subsidies, constructing market-rate homes costs our state and local governments nothing. commensurate benefits...” That statement makes it blatantly clear that the guys from the Fed are trying to support developers at the expense of the residents and the economy of the city of Minneapolis, because no real economist would claim zoning and building codes do not help protect buyers, property values, homeowners’ wealth, and a city’s economy. Paragraph fourteen: To be absolutely clear: The private sector cannot solve all of our housing problems. State and local government support will remain necessary. Even massive increases in supply won’t make housing affordable for families in extreme poverty. The problem for these families is poverty itself; the solution is income support for housing and other needs. This is the only paragraph that makes sense to an economist, and probably most non-economists. Affordable housing is an income problem that cannot be solved (or helped) by allowing developers to gut healthy neighborhoods, and, for those with little or no income, and with limited future possibilities, government may be able to help. But neither I, nor any other reader, should assume that because this article ends with a truthful statement that anything prior to this paragraph is either honest or factual. Paragraph fifteen: But for most of our neighbors, focusing too heavily on housing subsidies as the solution is wrong. Increasing market supply must be central to the response. And that means building many more homes in all communities throughout the Twin Cities. Aside from not believing the people who cannot afford housing are Feldman’s and Wright’s “neighbors,” their unsubstantiated claim that subsidies are not the answer (again, a straw man argument I did not mention in my article and, as far as I know, no one else is using) is neither a necessary nor sufficient condition to support “up- zoning” in the City of Minneapolis as part of a plan that will help developers’ profits, hurt current homeowners, and do nothing to benefit the people the plan claims it will help (the people left behind by previous plans and who will be left even further behind by this plan as their neighborhoods are bulldozed for profit and they are forced, because of higher rents and housing prices, to leave the city). And, once again, given that any real economist should know the difference between quantity and supply (a technical economic term that is clearly defined in textbooks), the co-authors of this article know, even if they do not want to tell the truth, that letting developers gut healthy neighborhoods for profit will not solve, and will more likely worsen, the affordable housing problem. That’s it. I stand by everything I wrote in the article published in the Star-Tribune on July 23, 2018, and can only add that the response by Ron Feldman, first vice president, and Mark Wright, senior vice president and director of research at the Federal Reserve Bank of Minneapolis makes it clear why I thought it was necessary to write something to support the residents and the economy of the City of Minneapolis. My main point was, and still is, neither the guys from the Fed nor others supporting the 2040 Plan in order to help developers and the banks that work with them have real economics on their side. Very simply, the argument by Feldman and Wright is: Because subsidies (which are not being offered as a solution) cannot fix the affordable housing problem in Minnesota, the only solution is to allow developers to increase profits by bulldozing healthy neighborhoods in Minneapolis. It is hardly an argument a real economist would want to make. Here, in an article/interview in Streetsblog USA, is the great Minneapolis liberal deal in a nutshell. My direct comments are in italics. have them ride the busses and light rail system the 2040 Plan is obviously designed to support. Yeah. Black folks don’t need cars to get to work, because the new Minneapolis liberals don’t want them here. It’s okay for rich white guys to have four or five cars parked in their big garages. So let’s make up the idea of off-street parking, even without a garage, being a secret subsidy and use it to make sure blacks can be kept as poor as possible. miles driven by 40 percent reduce emissions by 80 percent, even if the population stays the same? Second, given that the Plan is to intentionally double the population of Minneapolis, even if everyone drove 40 percent less, emissions will go way up because of the greater population. This is either a Houdini Plan or a Plan based on the assumption that everyone in Minneapolis has an IQ of around 20. Overbuild on parking? That is a blatant admission by the city’s director of Public Works that the 2040 Plan is not about helping the residents or the city of Minneapolis at all, it is to help developers profit at the expense of residents and the local economy and to cover up bad metro transit decisions made by the Metropolitan Council. It will increase the city’s carbon footprint, adding to the global warming problem. It will increase income and wealth inequality by diminishing the wealth and quality of life of all but the wealthiest individuals families. It will force people, black and white, into owning high maintenance older cars, because no one wants to leave an expensive car on the street. It will increase their auto insurance premiums. It will increase stress and impose a financial burden by having to get up in the middle of the night to move cars parked on streets when it snows. It is a discriminatory policy based on the false “environmental” claim that people who rent apartments with no off-street parking will use public transit. It is, at its core, an attack on families, especially black families, who will be pushed even deeper into a rent-for-life cycle of poverty with an ever decreaing opportunity to benefit from home equity. housing for families, the Minneapolis 2040 Plan should win a prize. Who in their right mind would argue that tearing down the most affordable single-family houses and replacing them with apartments that discourage or make it virtually impossible to own a car is going to financially benefit the people who live there? Or claim it is good for people to live in apartments without cars and be limited in what they do and where they work by mass transit routes? The 2040 plan is an accompaniment to the huge (and increasingly expensive) condo developments being constructed all around the city. Its intention seems to be to divide the very rich from everyone else by weakening the middle class and hurting the poor even more. with apartments that will not be affordable for low income people. By letting developers destroy all single family neighborhoods and intentionally forcing families into renting for life, the Mayor, the City Council, and the Planning Department are destroying the wealth of low- and middle-income people as the possibility of home equity disappears one house at a time. If you look ahead a few years, what you are going to see is a city with a wealthy class living in large houses around the lakes and in condo towers starting at one-million dollars a unit and a growing percentage of what used to be middle- and low- income people trapped in a rent-for-life downward spiral. It is unlikely any city anywhere in the world has ever put together a plan as destructive and racist as the Minneapolis 2040 Plan. The Minneapolis 2040 Plan’s rent-for-life privatization scheme will not solve the affordable housing problem, even if a rent-for-life privatization scheme is seen as an acceptable solution. most valuable financial asset, which is home equity. It will increase racial disparity by making it even more difficult for minorities to buy homes. It will not eliminate the discrimination that prevented blacks from obtaining mortgages and kept too many in a rent-for-life cycle of poverty. It will increase the disparity between blacks and whites in Minneapolis by making it even more difficult for blacks to purchase homes, because it was redlining, not single-family zoning, that caused the problem. It will force many black families out of the city as young whites with money move into the new, higher rent apartments that replace the single- family homes they will be forced to leave. Very simply, a plan to make all but the very wealthy renters-for-life is not a true long-term solution to anything; it is a short-term plan for young working white people who, if they, at some time in the future, want to have a family and move into a home with grass and off-street parking, will find it almost impossible to do so. Regardless of the lies peddled by the Mayor, the City Council, and the Planning Department, the truth is, increasing the population density of Minneapolis by increasing its population will cause more, not less, damage to the environment, increase the city’s impact on global warming, make the affordable housing problem worse, increase city costs and taxes, and force people (mostly people of color) out of the city or into homelessness. As such, the up-zoning policy in the 2040 Plan is not only racist, it is environmentally irresponsible and hurts, rather than helps, the 2040 Plan meet its stated goals. There are no benefits to offset the irreversible damages to virtually every resident of the city, other than adding to the profits of developers and investors and helping the Metropolitan Council justify bad decisions it made regarding mass transit, especially the light rail system. housing problem worse, raise taxes, eliminate the possibility of home ownership for most families (thereby taking away the opportunity to acquire equity and provide for retirement), and lead to the irreversible destruction of one of the world’s great cities. And the damage cannot be reversed. This is a one and done decision. It’s not like giving something a try and then going back if it doesn’t work. Once single-family homes and neighborhoods are destroyed, they will be gone forever. Why are so many articles from liberal media sources and think tanks supporting the racist, wealth destroying, wealth shifting, family destroying, and environmentally irresponsible Minneapolis 2040 Plan, while heralding the mayor and City Council President as new liberal heroes and telling readers the Plan should be duplicated all across America? Whatever their reasons, the fact is, each article, whether in Esquire, Slate, The New York Times, The Seattle Times, or from the Brookings Institution, reads like a high-school newspaper’s bad editing of the collection of lies being passed around by the Public Relations firm hired by the liberal heroes in Minneapolis to make what is, in reality, a far-right plan to destroy one of the nation’s great cities, sound like a victory for liberals. The headline and opening paragraph of the Brookings “story” should go down in history as another great red nosed reindeer legend. Make sense? Not at all, except possibly to those who want to destroy America, one city at a time. At it’s best, the Brookings’ article is cute fiction for very young, well-to-do, white children, but it has nothing to do with reality or truth. At one time, Brookings employed real economists, but all things change. Anyway, the question is: What is the Brookings’ Santa really bringing Minneapolis? Anyone reading her little Santa and his elves story has reason to assume that “roughly half the city’s land” consists of one-hundred percent large single family homes on large lots. The elimination of zoning protections will affect two-thirds, not half, of the city. It is not the city’s land, it is private land whose uses are regulated by city codes and laws. Most important, the actual City of Minneapolis is not even close to the picture presented by the mayor and the City Council, peddled by the City Council’s PR firm to the liberal media, and presented in the Brookings’ Santa story. of large, medium, and very, very small homes on large, medium, and very, very small lots mixed in with duplexes, triplexes, fourplexes, apartment buildings, coffee shops, restaurants, retail stores, office buildings, and more. In other words, all the great things the Minneapolis 2040 Plan promises to provide by eliminating single-family zoning already exists. And it exists because developers and investors were held in check by single-family zoning laws that also provided for exemptions that made economic and quality-of-life sense for the neighborhood. That is the truth the City Council’s Public Relations firm was able to hide from “liberal” media people while selling the fake sizzle. So here we are, in the 21st century, watching a mayor, name of Jacob Frey, and a City Council President, name of Lisa Bender, start a race war to further their political ambitions as liberal or progressive Democrats by putting together and selling a racist and environmentally irresponsible city plan. It is a Plan the City Council President and her sidekick mayor are telling the world is a magical way to Make Minneapolis Great Again. He’s right, of course. Those are goals any real liberal would love. He is also correct in assuming it is safe to make that claim knowing many of the staunch liberals he is talking about will be satisfied with the headlines and will not take the time to read the plan itself. But, just to make sure, the “new liberals” hired a public relations firm to spread the word of their greatness throughout the land and herald the Frey- Bender duo as heroes of the black man and the Native American community as they carry on the fight for truth, justice, and the American way. The problem is, if the policies in the Plan work against the Plan’s great goals, then the mayor and the City Council are playing real liberals, progressives, and Democrats for chumps. The truth is, Frey and Bender are hucksters, if ever a huckster there was. Of course, it would not be acceptable to call someone a huckster unless he or she fits the definition. Okay, then. Hucksters they are. And they, with the help of their hired-gun public relations firm (paid for with taxpayer money), have conned a lot of “liberals” into buying the snake oil they are selling, including some of the best and the brightest, such as The New York Times, Esquire, Slate magazine, even the Brookings Institution. Liberals all, and, as Mayor Frey apparently assumed, liberals without the time or interest to investigate the bold claims before publishing the sizzle they were handed by a public relations firm that specializes in sizzle. If we get past the headlines the great and wonderful Frey and Bender are using to declare themselves liberal or progressive heroes, and get down to what the Plan will actually do, what we have is a lies-trump-facts policy that, until recently, was the kind of thinking perfected by far-right con men. In other words, anyone who looks behind the happy headlines can easily see what the Minneapolis 2040 Plan will actually do. * Move black families out of their houses, out of the city, and into homelessness so young whites with money can move in, which, in the past, was called gentrification, and is now called “lightening” black neighborhoods. * Make the affordable housing problem worse by destroying the most affordable single-family homes in all neighborhoods (even more in minority neighborhoods), which will make it virtually impossible for minorities, as well as middle-income whites, to ever move from renter to owner. * Increase the city’s carbon footprint and its impact on global warming. * Keep as many families as possible in a cycle of rent-for-life poverty by destroying the possibility of home ownership for all but the wealthiest by taking away the possibility of low- and middle-income whites and blacks of ever owning a home and building equity, which, for most families, is the single most important financial asset in their portfolio. And because fewer than twenty percent of black families versus about eighty percent of white families own homes, black families will be hurt more than white families. * Increase the profits of developers and investors who have the freedom to gut the city for profit. * Increase the costs of running the city. * Increase taxes to pay for higher city costs. * Increase income and wealth inequality. Great goals, if you’re a white guy wearing a white sheet and a pointy white hood. For a “staunch liberal,” an old-time Democrat, or an old-time Republican, not so hot. The recipe is new, the results are not. An alternative to the current Minneapolis 2040 Plan would begin by keeping the Plan’s most important goals, which include helping solve the affordable housing problem, reducing the impact of the city on the natural environment, reducing traffic and drive time by encouraging the use of public transportation, increasing efforts to restore and develop neighborhoods left behind by past plans and discrimination, expanding policies that are working, eliminating policies that continue discriminatory practices, and looking at new policies that can improve education, job opportunities, and the economy of the city, region, and state. It would remove the unjustifiable goal of increasing the population and population density of the city, along with policies in the current plan that do not help reach the Plan’s goals, such as using false economic jargon to claim rezoning the entire city to allow developers to tear down single family homes in healthy neighborhoods and replace them with apartment buildings with no off-street parking will help Minneapolis solve Minnesota’s affordable housing problem on its own without the participation of the rest of Minnesota, in particular the City of St. Paul and all Minneapolis and St. Paul suburbs. An alternative plan would be based on the fact that the city of Minneapolis is not an isolated government or population unit. It is connected with and intertwined with the people, governments, and economies of its suburbs, the city of Saint Paul, St. Paul suburbs, and a large surrounding area. A map that shows where people who work in Minneapolis live includes large sections of western Wisconsin as well as areas in Minnesota outside Minneapolis and St. Paul suburbs. Therefore, for a plan to be successful, meaning it can be expected to help reach its stated goals, it must begin with the fact that Minneapolis is only one of a large number of independent, but interrelated, cities, towns, and states in a very large surrounding area. The fact that the Metropolitan Council, which has to approve the Minneapolis Plan, was created to deal with that exact issue does not alter the fact that a Minneapolis Plan should be based on understanding the place and role of Minneapolis as one part of all the surrounding communities. impact the City of St. Paul and the Minneapolis suburbs they may move to. A Plan by Minneapolis that will increase the city’s impact on carbon emissions and global warming will adversely impact the residents and economies of the City of St. Paul and all Twin Cities suburbs. A Plan by Minneapolis that ignores the fact that people who work in Minneapolis live in Minneapolis, Minneapolis suburbs, St. Paul, Saint Paul suburbs, small towns in Minnesota, and far into Wisconsin, cannot succeed. A Plan by Minneapolis that ignores the fact that people who live in Minneapolis work in Minneapolis, St. Paul, Minneapolis suburbs, Saint Paul suburbs, the surrounding area, and Wisconsin, cannot succeed. The 2040 plan, as it is, is based on the implied assumption that people who live in Minneapolis work in Minneapolis and who work in Minneapolis live in Minneapolis, which is why the plan will fail. Minneapolis cannot provide affordable housing, even if affordable housing is defined as rental units, not home ownership, for all people who live in this large area, and the fact is, there are many people who work in the city who do not want to live in the city. Private individuals and companies, and so- called free-markets, cannot adequately solve all problems, which is why the main function of a city (and metropolitan) plan must be to focus on the role of government in developing the economy, protecting property rights and property values, eliminating racism and bigotry, and helping those who need help. On a simple level, it can be argued, given the definition of affordable housing, that every house in the city, including those that cost millions of dollars, is affordable to someone, because every house in the city is owned by someone, and because the definition of affordable housing is that it should cost the buyer 20 percent or less of family income. Of course, the 2040 Plan’s focus is on affordable housing for low- and middle-income families, those who need help the most, which is, without question, an important goal. But because the Plan misuses the application of the definition of affordable housing, as well as the economic idea of supply and demand, the result is to justify privatization policies that help mainly developers and landlords without solving problems or reaching the Plan’s goals. One simple plan to increase the quantity of affordable housing, given that it is a growing problem for middle-class families, would be to direct developers to develop vacant lots and abandoned houses along the light rail system. There are other vacant lots and buildings throughout the city that could also be developed. Of course, such a plan would be successful only under government oversight, regulations, and guidelines, not by giving private developers the freedom to do whatever they want. Most important, “solving” the affordable housing problems should create opportunities for people to buy homes, not just pay rent, which is the “solution” in the current 2040 Plan. Intentionally increasing the population density of a city has virtually no benefit (other than for developers and investors). It only increases costs across the board. Which is why every goal in the 2040 Plan must be addressed by looking at the interconnected area, not the city of Minneapolis as an isolated governmental unit. It makes no sense to have Minneapolis and St. Paul, and all the other entities in the area, putting together independent 2040 Plans on the false assumption that the Metropolitan Council can fix the mess. That is not likely. All anyone has to do to understand the interconnectedness is to drive around the city or cities, especially during rush hour, which is becoming almost a daylong event, and see the people driving back-and-forth between the two cities and in and out of the cities. There are already periodic traffic jams, with traffic coming to a stop, heading east on Highway 94 heading into Wisconsin and west on 394. Increasing the population and population density of a city imposes huge costs on the natural environment. Addressing negative impacts on the natural environment requires addressing particular issues and problems. Mass transit is one; therefore it makes sense to examine the success and failures of the existing light rail system as well as the bus system in Minneapolis. Of course, neither city buses nor the light rail system stop at the edge of the city. They go into the suburbs. Increasing population density will not automatically increase the use of public transportation or the percentage of the population walking or biking to work. Minneapolis has, within the last couple years, constructed bike lanes on roads throughout the city, taking away parking and driving lanes. The assumption was that by trading traffic lanes and parking for bike lanes, more people would ride bikes to work or to the store. So far, it is not clear if the bike lanes are serving their purpose. Although some seem to be successful, others are lightly used and some seem unused. But there is a traffic problem. And when cars sit and idle in traffic, they are imposing greater damage to the environment than when they can keep moving. In other words, traffic flow is important, and Minneapolis may have traded that for underused bike lanes. There are parts of neighborhoods and areas of the city that should probably be bulldozed. Because, in some cases, replacing existing housing with apartments with no off-street parking makes sense. But not in all cases, not in all neighborhoods, and not without government and neighborhood oversight. An alternative Plan would, at least on paper, be designed to actually help the citizens, businesses, economy, and natural environment of the city of Minneapolis. And that can only be accomplished with a plan that has all communities in a very large area working together. The existing 2040 plan was conceived in a vacuum and has little to do with the real world. You do not tear down, out of spite or anger or to make up for past racist activities, what is good in a city, region, or state. You build on what is good and make it better. You do not hurt one group to help another, which is what was done in the past. The idea that the only way to help one identifiable group is to hurt others is based on a zero sum game, which is what happens in a no growth or slow growth economy. Which is why a good plan would be based on encouraging economic growth that, when handled correctly, can help everyone. The current Minneapolis 2040 Plan helps developers and landlords and hurts virtually everyone else, because it is a zero-growth plan. It would be better to follow President Kennedy’s idea that, “A rising tide lifts all boats.” And to not ignore the fact, pointed out at the time by Vernon Jordan, that some boats are stuck on the bottom. In other words, the rising-tide argument is not an argument for privatization; it is an argument that makes sense only if government plays a role, making sure everyone is in a boat and that there are no boats stuck on the bottom. Two-thirds of Minneapolis is currently zoned for single-family homes. But within every single- family neighborhood, regardless of how poor or wealthy the residents are, there are duplexes, fourplexes, condos, and apartments, there are green spaces and parks, grass and trees, and there are corners or blocks that are a combination of commercial and retail businesses. You cannot walk or bike or drive more than a few blocks in Linden Hills or Fulton or Kingfield or South Minneapolis or North Minneapolis or Northeast or anywhere else in the city without finding a corner with coffee shops, restaurants, and retail stores. One of the main goals of the current 2040 Plan is to create a mix of residential, commercial, and retail buildings. That goal was met years ago. Which is why there is absolutely no reason to allow developers to tear down as many single- family homes as are profitable in order to build more commercial, retail, restaurant, or whatever buildings on every block. The current plan says it would be great if people could walk a few blocks to a restaurant or a retail shop. If the people who drew up the plan had grown up in the city or knew the city, they would know what the 2040 Plan promises already exists throughout the entire area currently zoned for single-family homes. Which is why the only thing the rezoning policy in the 2040 Plan will do is destroy what is good, while benefiting no one but developers and landlords. In other words, the people behind the Minneapolis 2040 Plan never intended it to be a plan for the city, or for all residents and businesses, or for the economy of the city and region. It was intended to help identifiable groups who were left behind or discriminated against in the past, which is a goal pretty much everyone in the City of Minneapolis agrees with. However, by falsely claiming single-family zoning was and is nothing but a racist practice with no benefits to homeowners, the city, and the economy of the region, the Plan’s backers created a race war and gave themselves the freedom to call anyone who complains about the Plan a racist. Worthington’s quote makes two things clear. One is that racial equity, not quality of life or economic growth, is the basis or foundation of the entire plan, even though none of the policies can help achieve that goal. The second is that by claiming to focus on people who were left behind with past plans, the current 2040 Plan does not serve anyone. It hurts, rather than helps, the people and neighborhoods it sets out to help, and it hurts virtually everyone in the city, other than developers and landlords. In order to have a plan that helps the people the plan claims it will help, as well as everyone else in the city and the city’s economy, the plan should focus on economic development with a special regard for the people who were left behind with past plans. The current Plan is a zero-sum plan whose goals are to help some at the expense of others. There is no way to promote economic development that can help everyone by tearing a city apart, and doing so will not make up for past disparities and segregation. It will make them worse. When homeowners sell their houses to developers, it is their choice. It is a voluntarily decision that normally includes having a plan for the future and equity from the sale to use for new housing, retirement, or to help their children financially. do so, and whether or not doing so incurs short- term and long-term personal, employment, and financial damages. And because renters do not have home equity to be used for new housing, or retirement, or to help their children financially, the financial burden they bear is likely to affect not only their own short-term well-being, but also their retirement and their children’s future. As such, the elimination of single-family zoning treats renters differently from homeowners. And because home-ownership rates in Minneapolis vary significantly by race, from about 80 percent for whites to less than 20 percent for blacks, with Asians, American Indians, and Hispanics in between, the elimination of single-family zoning treats people differently by race. Which means the elimination of single-family zoning in the Minneapolis 2040 Plan violates both federal and state fair housing laws. The Metropolitan Council is responsible for managing the impact on the natural environment of all Metropolitan Districts under its jurisdiction. And because the Minnesota Environmental Rights Act (MERA) prohibits acts or plans that are likely to impair the environment, the Metropolitan Council does not have a legal right to approve a Plan from any municipality or District that is likely to impair the environment, because doing so is prohibited under Minnesota State Law. As such, the Minnesota Environmental Rights Act also prohibits the Metropolitan Council from approving a plan from one municipality or District that is likely to impose spillover or external environmental damages to one or more other municipalities or Districts. For the record, the Minneapolis City Council has admitted in court that the up-zoning policy in the Minneapolis 2040 Plan will impose environmental damage. Which, given the Minnesota Environmental Rights Act, means the Metropolitan Council cannot legally approve a Plan that includes the elimination of single-family home zoning. zoning, cannot be contained within a cylinder placed over the city of Minneapolis, the up-zoning policy of the Minneapolis 2040 plan will impose environmental damage on other municipalities and Metropolitan Districts. Which means the elimination of single-family zoning, called up-zoning, must be removed from the Minneapolis 2040 Plan before it can be legally approved by the Metropolitan Council. Additionally, it should be noted that the Minneapolis 2040 Plan is based on a false population projection. Instead of using a real population forecast, the planners made up a number large enough to justify the up-zoning policy that will let developers tear down single family homes and replace them with apartment buildings in order to accommodate the false population number. If the false population number is replaced with an honest forecast, there is no need to replace single family homes with multi- unit apartment buildings, because an honest population forecast does not justify doing so. The writers and promoters of the Minneapolis 2040 Plan continue to claim all the studies and research conclude increasing population density reduces the carbon footprint. smaller carbon footprint than the same number of people spread out in a suburb where people have to drive further to get where they are going. But the research warns that the city versus suburb comparison does not apply to increasing the population and population density in either a city or a suburb. In other words, what every valid study says is that if population density is increased in either a city or a suburb, carbon dioxide emissions will increase. That is, of course, a fact that is not even debatable. Therefore, the Minneapolis 2040 Plan is based not only on lying about the population forecast, it is also based on lying about the environmental studies and research regarding the relationship between population density and carbon dioxide emissions. In other words, Minneapolis planners lied about the relationship between population density and carbon footprint in order to justify up-zoning in order to intentionally increase the population density of the city to meet the false claim that doing so will reduce the city’s carbon footprint. environmental damage to the City, but will spill over to other municipalities and Districts governed by the Metropolitan Council. Most important is that there are recordings of meetings that prove the ONLY reason the false population forecast and the elimination of single- family zoning were included in the Minneapolis 2040 Plan is to allow developers to profit by destroying the city of Minneapolis, with Mayor Frey, City Planners, and all but one City Council Member willing to sacrifice people of color and indigenous neighborhoods, and to sacrifice the natural environment and the health, wealth, and well-being of hundreds of thousands of Minneapolis residents, in every single-family neighborhood, just to pad the pockets of developers and investors.